The two men, who were charged with attempted murder in absentia last week, said they had spent New Year holidays in Switzerland before, and Russian media have reported they also travelled to Amsterdam, Milan, and Paris. "It's famous for its 123-meter spire", he said, adding that its clock is also notable. In the weird 25-minute interview, the pair denied all knowledge of the plot and insisted they were just two men going on holiday to see the 123m steeple at Salisbury Cathedral. 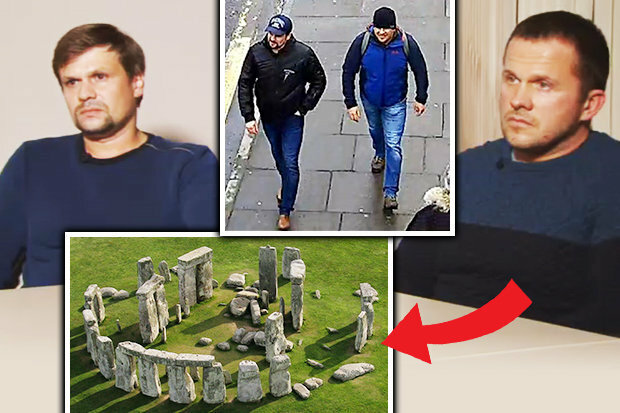 As Russians digested Thursday's weird interview on Russia's state-sponsored TV channel with Alexander Petrov and Ruslan Boshirov, the men's itinerary was one thing that didn't add up for people here, even those who don't think Moscow stands behind Skripal's poisoning. Police last week released dossier of evidence that pointed to the likely involvement of the two men including CCTV footage from the town, flight records, accommodation details and scientific tests that identified traces of Novichok at a hotel where they stayed. RT has a licence to operate in the United Kingdom but is under investigation by regulators over its coverage of the Salisbury affair. Simonyan later wrote on Twitter: "Guys, I don't know if they're gay or not". "Crucially, at least one man's passport files contain various "top-secret" markings, which, according to at least two sources consulted by Bellingcat, are typically reserved for members of secret services or top state operatives", it added. On Thursday, both men denied that they were GRU agents. "The lies and blatant fabrications in this interview given to a Russian state-sponsored TV station are an insult to the public's intelligence", Prime Minister Theresa May's spokesman said. Boshirov insisted: "Isn't it silly for a normal man to carry women's perfume?". But we can tell you that based on the livestream the video was not unedited. They said they may have approached Skripal's house by chance but did not know where it was located. The men say that their lives have been "turned upside down" by the allegations and want an apology. Russian President Vladimir Putin's spokesman, Dmitry Peskov, said Friday that Russian authorities will consider Britain's request to interrogate them if it comes.